Girls, they want to have fun. They want to have fun! YES! The girls just want to have fun. I'd say SMARTA is pretty fun for Celeste, Pandora, Pyxis, and Carme! 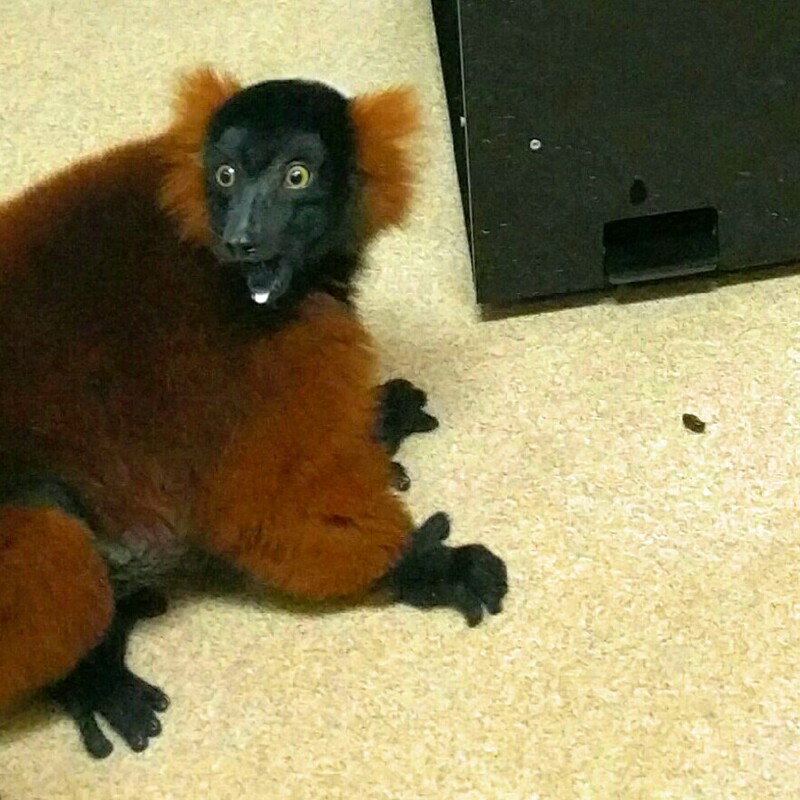 And for some reason, Cyndi reminded me of the red ruffed lemurs. 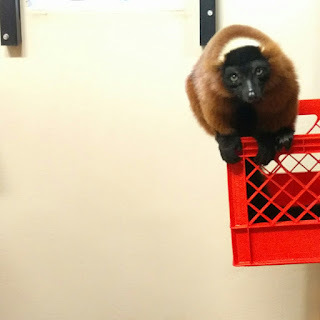 This week I got to work with 2 new red ruffed lemurs. Pandora and her one-year old daughter Celeste joins the rotation to be part of my SMARTA color vision study. Celeste was very excited on her first day and her enthusiasm continues to the second day. She is currently my youngest participant. Celeste's mother, Pandora, was equally enthusiastic to participate in the study. Both had participated for two days and will continue their sessions next week. Caught Celeste mid chewing craisins. Looks like she's very excited. Pandora in her red (green? dum dum dum) perch. Carme continues to have at least 2 sessions per week since I came back to Duke Lemur Center. We addressed her left hand preference and her tendency to touch the left square at the beginning of each trial regardless of what color the square is. We don't know if she is has trouble using her left hand to reach to right square or if it's a superstitious behavior. Over the past few weeks, she had progressed tremendously and we feel like she finally "got it" this week. We ran a few testing trials with her and I think we are comfortable enough to say that she had graduated from training to fully automated testing. She should be on testing sessions next week. I talked about bridging here, where a bridge is a stimulus that "bridges" a correct response to a reinforcement (usually a food reward) and is almost often an auditory stimulus such as the sound of a whistle, clicker or praises (Good girl!). A bridge is usually an anticipation of something positive going to happen and bridging tells an animal that they did the desired behavior and a reward is on its way. 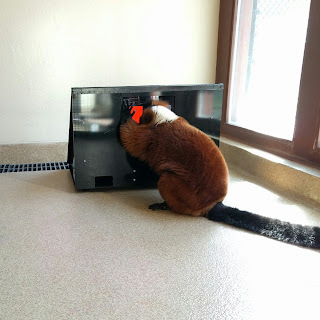 At the beginning of this study, we thought that the sound of the conveyer belt inside SMARTA is a good bridge for the ruffed lemurs. We soon learn that it wasn't the case, and that they are probably not paying attention to the sound of the conveyer belt or that they might need to be trained to recognize that the sound of the conveyer belt is a bridge. 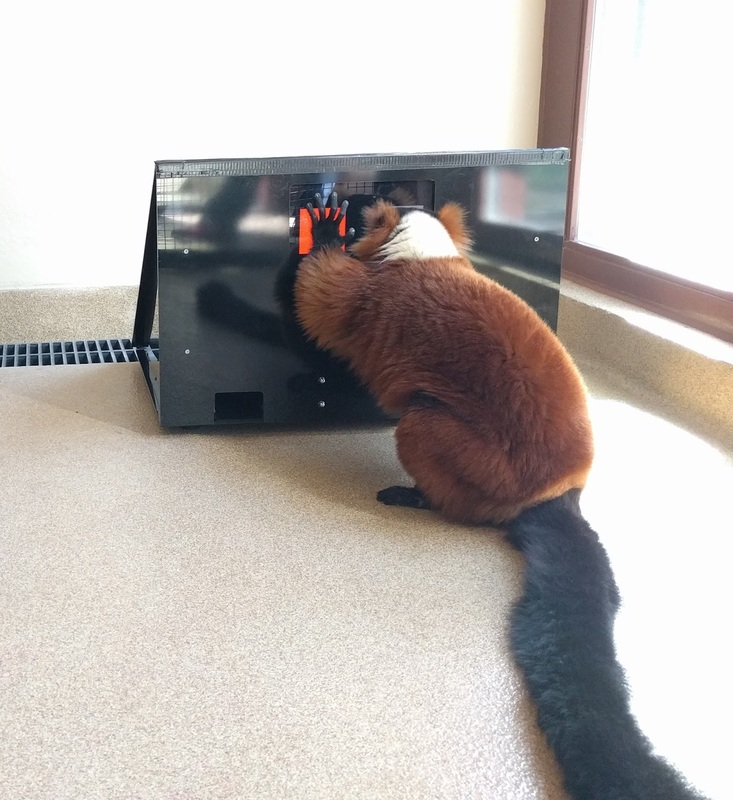 As most ruffed lemurs at the Duke Lemur Center are whistle-trained, we have incorporated the whistle as a bridge when we train them to use SMARTA. Here's a short video of Carme doing a red and gray discrimination task. Notice that the moment she touches the red square, a whistle is used to bridge her correct behavior to a craisin that falls off the chute a few seconds later. Imagine without the whistle. Carme touches the red square and looks to the left. A craisin falls off the chute. The duration between touching the red box and looking to the left only takes a few seconds but that is also how long it takes for SMARTA to dispense a food reward. Carme might then associate looking to the left with a food reward, or any other behaviors she did after touching the red square. Another positive aspect of using a whistle as a bridge is that we can tell the lemur almost instantaneously that they did a desired behavior as opposed to just giving them a food reward. 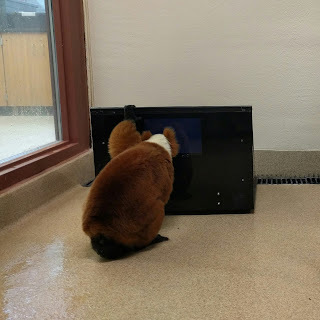 Without a bridge, it might take more time for a lemur to learn the correct behavior or worse, associating an incorrect behavior with a food reward.